With the announcement of VISION2020, Eileen Fisher and her team clearly detail the first five years of the plan to push towards 100% sustainability. Eileen Fisher portrait and fashion spread photographed by Matthew Cylinder, model Tess Richardson @img Stylist Jessica Soga, Hair & Make up . Gracefully hastening toward her guests, wearing long layers of sheer black silk, and crowned with a perfectly styled white bob, the hostess of the hour makes a noteworthy entrance. A smiling face may not be the look de jour in the world of fashion, nonetheless Eileen Fisher’s beaming exuberance, as she takes my hand in welcome, has a healing quality that the industry is so very much in need of. The “Eileen Fisher Intimate Brunch” event I attended in September 2015 was organized for the press, but funnily enough when I received the invitation, the word intimate in its title made it sound very personal. So for a few minutes, I thought it would be just Eileen and myself. I was excited but nervous too. I’d never met the woman in person, and I couldn’t imagine what I’d done to deserve such a privileged invitation. So I reached out to her public relations department and was told it was an intimate party of twelve. That made more sense to me. I was disappointed but also a bit relieved. I’ve always had a great admiration for the Eileen Fisher brand, and I was excited to meet the woman behind the empire. From the time I began research on Eileen Fisher, the woman, I discovered a person of passion and grit, a human rights advocate with a sustainable lifestyle ethos. She used her background in graphic design to create a brand to reflect her interpretation of a modern woman. That sensibility established a company that has persevered for 30 years. 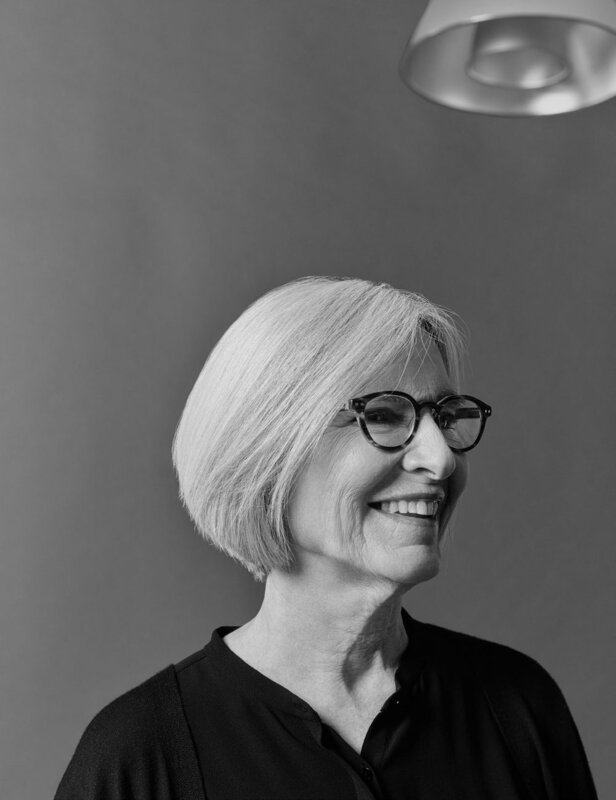 Eileen Fisher’s startup story has inspired many entrepreneurs. She had a dream of creating effortlessly chic designs made of fine quality fabrics. Clothes that would not only endure, but empower women. She tells a story of starting her brand and funding her first small collection with a bank balance of just $350. She was the first of her peers to acknowledge the worth of older women in her campaigns way back, when no one else was being so brave. Now she has 1200 people working for the brand and 65 stores nationwide, Canada and the UK. The brunch took place at Eileen Fisher’s spacious sun drenched showroom in Midtown. Arriving guests were warmly greeted and offered a glass of Prosecco Mimosa, a very enjoyable start for the event. We were then escorted to a beautiful table, adorned with freshly cut flowers and an assortment of intricately prepared seasonal dishes. Amid this lovely atmosphere, Eileen Fisher and her friendly team of six intelligent women presented their new mission. Local efforts are also in place. Since 2009 Eileen Fisher has recycled clothing as part of an initiative they call Green Eileen. Gently used clothes are collected at stores and resold - to support programs for women and girls. Green Eileen Senior Advisor Cheryl Campbell (along with other on the team) pioneered the idea because; “I thought our clothes lend themselves to recycling. They are designed to have longevity, both in terms of the styles and the quality. The average American throws out seventy pounds of clothing a year; through Green Eileen we create a second market. What we can’t sell, we upcycle at Green Eileen’s community-building workshops and through initiatives and partnerships to create new products.” Eileen Fisher works hard to address many areas of social injustices. She is involved with a social consciousness team that oversees grant programs for women owned businesses and activating leadership, as well as numerous community partnerships and philanthropic store events. It is Eileen’s belief that by helping women to find their voice they can become strong leaders within their families, communities, and lives. Knowing the fearlessness of Eileen and her team, I am excited to watch the progress to VISION2020. I’m sure they are too. How exciting it must be for the brand to take on challenges that have the potential to benefit so many people, while healing the planet. It’s one thing to have a thriving business, but the satisfaction and pride that must come from helping others along the way would be immeasurable. AGB: What gives you the biggest sense of accomplishment, personal and professionally? EF: Professionally, I feel a sense of accomplishment around our deepening sense of purpose within the company. Many important pieces of the company that used to exist in their own separate spheres are now being integrated into the whole — the Foundation, Girls Program, recycling, and the Learning Lab. The company is so much deeper and broader now than it was even a few years ago. We can see, more clearly than ever before, the possibility of making a larger impact – in the fashion industry, helping people think about what they buy and to understand that their choices matter, educating them in how they make their choices. Business that is driven by purpose and sustainable practices can be good for the world. We’re on a learning journey and building toward that vision. I’m experiencing a similar dynamic and sense of accomplishment in my personal life. I feel so satisfied with the way that important aspects of my life have woven together — family, friends, work, personal passions like meditation and yoga. My life has a sense of wholeness. And I can hold complexity and difficult situations like never before — I feel that I can be with anything that comes my way. I now understand and work with fear on a moment to moment basis — I can express my perspective openly, choose to take some action, mediate challenging conversations. This represents huge growth for me. It still astounds me when I think of how much I’ve learned. AGB: You obviously have a strong sense of ‘the right thing to do’ and ‘how things should be’. It’s evident from the very beginnings of concepting your brand. How did this fearlessness come about? EF: I don’t think of myself as fearless — honestly, I struggle with fear everyday. But I am able to recognize it, and I keep going in the face of fear. I find that getting in touch with what matters most to me and having a sense of purpose helps me move forward. One of my biggest challenges has been finding my voice and gaining the confidence to speak up. I’ve learned over time that I actually have a lot to say, particularly around issues like sustainability and business as a movement. My voice matters. Ultimately, purpose conquers fear. Even before I started the company, I could see the clothes as pictures in my mind. I followed that vision and felt my way into the work. There is something about inner knowing - the inner vision – and the collaborative way we work that together combine somehow to give me energy and confidence to keep going, to take the next step. I am a listener by nature. That’s how I connect and tune in. My inclination is to ask questions, to get the right people in the conversation and let everyone have a voice. The collective and collaborative process produces a lot of energy - it’s the source of creativity and innovation.